Sometimes a cigar is just a cigar…except when it is crisp, golden-brown phyllo wrapped around a mix of cheese and herbs. Then it’s perfect party fare. 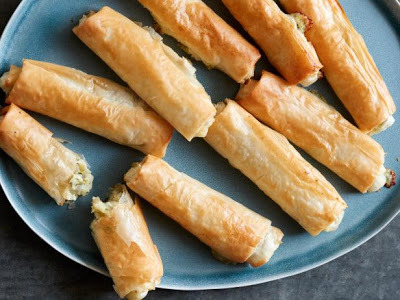 Don’t be tempted to overstuff the cigars: the smear of salty filling is just enough to balance the layers of phyllo, and excess filling will leak while baking. Rolling the cigars takes a little time, so try making them ahead and freezing them in an airtight container. Bake them right from the freezer, and eat them piping hot. Preheat the oven to 400 degrees F. Mash the farmer’s cheese, feta and mozzarella together in a bowl using a fork. Work the egg in with the fork, then stir in the parsley, dill, chives, lemon zest and a large pinch of black pepper. Put a damp, clean towel on your counter. Unfold the phyllo sheets on top and cover with another damp, clean towel. Put 1 sheet of phyllo on a cutting board with the long side closest to you and brush lightly with butter. Top with another sheet of phyllo and brush lightly with butter. Top with a third sheet of phyllo and brush lightly with butter. Cut the phyllo in half crosswise, then cut each half horizontally into thirds. Place the rectangles on a baking sheet and set aside. Repeat with the remaining phyllo. Working with one buttered phyllo stack at a time, spread a heaping tablespoon of cheese along the long edge of each rectangle, leaving a 1/2-inch border at each end. Fold the sides over the filling, then roll up from the bottom edge of the phyllo. Transfer rolled cigars to a baking sheet seam-side down and brush each with a little butter. Repeat with the remaining phyllo, filling and butter. Bake the cigars, rotating the pan halfway through, until crispy and golden-brown, about 25 minutes. Transfer to a serving platter and serve. Phyllo sheets vary in size slightly. They come in large sheets like the one in the ingredient list above or half that size. The large sheets vary in size by an inch or two. Regardless of variation, the most important thing is that you get 6 equal rectangles out of each set of 3 large sheets.